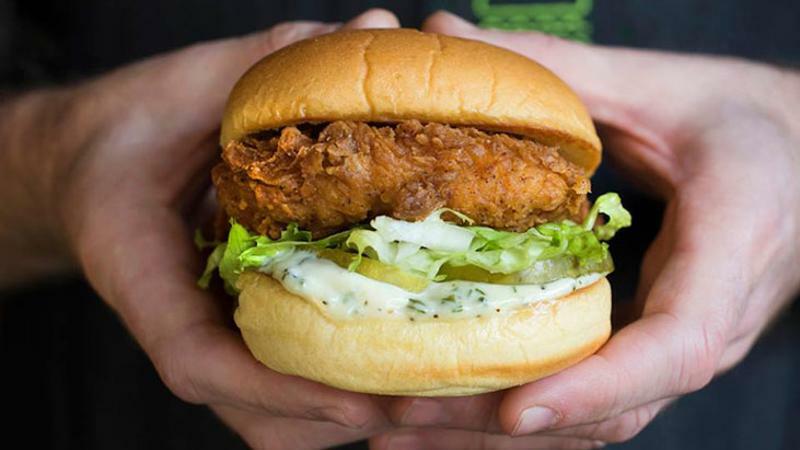 Shake Shack said Thursday that its first-ever chicken sandwich, the Chick’n Shack, will this month roll out nationwide. The Chick’n Shack debuted as an LTO last summer but was limited to three Brooklyn, N.Y., locations. Its introduction followed much speculation that the fast-casual chain—whose menu remained focused on burgers, save a chicken hot dog—would serve chicken in a new product or spin off its brand with a restaurant focused on the protein. Shake Shack CEO Randy Garutti said on an earnings call last year that guest demand for the sandwich—then called The ChickenShack—was so “overwhelming” that the three locations offering the item ran out of supply in just two days. “The introduction of chicken marks a new era for Shake Shack, staying true to our core menu while continuing to innovate new items our guests have asked for,” Garutti said in a statement. The Chick’n Shack features fried chicken, pickles, lettuce and buttermilk-herb mayo on a potato roll. By adding fried chicken to its permanent lineup, Shake Shack positions itself to compete with fried-chicken juggernaut Chick-fil-A, which was last year rated consumers’ favorite quick-service restaurant, as well as Yum! Brands' expanding chicken concept Super Chix.